This concludes the first round of black garlic; I have a product the smells and tastes like black garlic but does not look black. 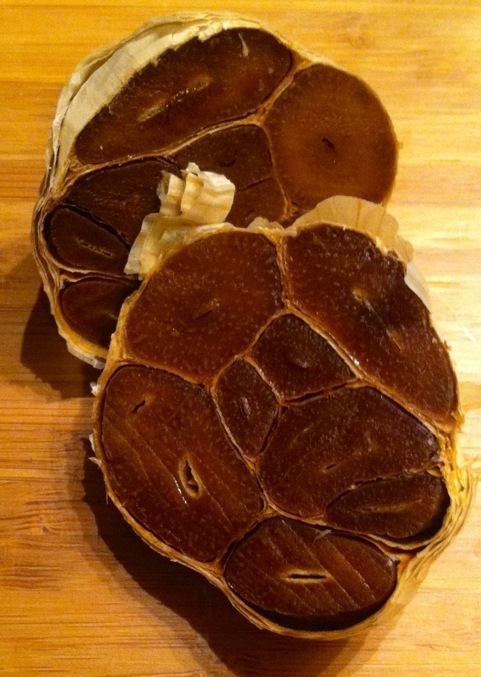 Black garlic isn’t really black to begin with, it is just a very deep brown; you can see this when you purée it with water, so the product I have is very similar but not quite right. Now it’s time to work on getting the color right. Round two will start in about a week with variable temperatures and added drying times. 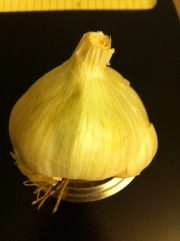 The forty days are up and it is time to cut the garlic to see what I have. There are major changes in the garlic and as you can see below, the garlic has turned brown, it is still a little firm, and compared to other black garlic that I have used, this one is more paste like. I am going to give it twenty more days then check it again. I removed a clove of garlic from the chamber, pulled it out of the mason jar and started to see some very promising changes. The skin is starting to brown, the cloves are becoming very soft, which is another trait of black garlic, and there is a stronger fermented smell. It’s hard to see real noticeable changes from the picture, I will be posting a cross section at the 20 day mark. After getting home from work I noticed a much different smell in the house; it wasn’t bad but it was different. The smell was very similar to roasted garlic, but not completely roasted. I am about six days in so I am guessing that the garlic is beginning to “cook”. I am very excited to see what it looks like after the next five days. 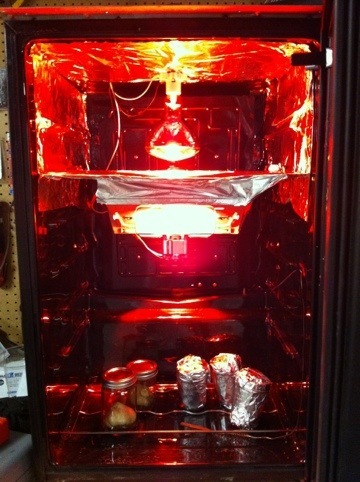 On October 8th I fired up the warming box and loaded it up with a pound of garlic. Before all of this, I had to actually make a box the could consistently hold a temperature of 140° F. I found a mini fridge for $20 that didn’t work to be my warming box. 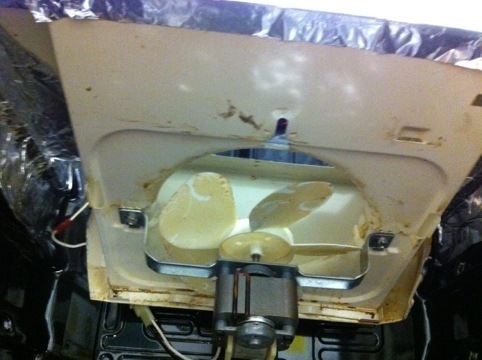 The next step was to heat it so I picked up a mountains socket and a heat bulb. When I replaced the hood in my kitchen, I saved the old one for a reason (I didn’t know what at the time). 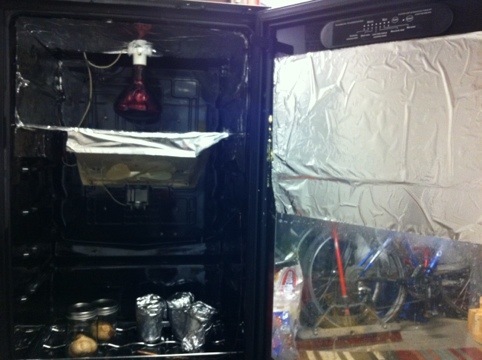 I doctored up the vent to slide into the mini-fridge. Now I have a functioning fan with two switches, one for the light and one for the fan; both of which came off my old hood and is mounted inside the box. The hardest part of the setup was wiring a thermostat so I didn’t have to keep checking on the box and switching it on and off. 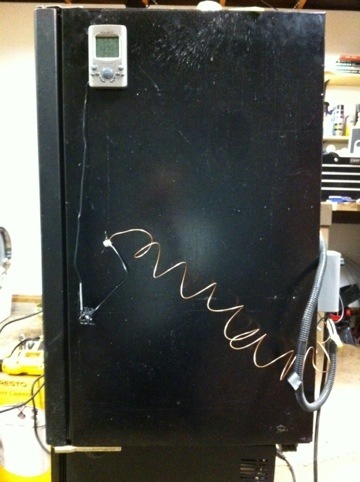 After a few blown fuses and wandering in the dark, I finally got it wired and functioning. 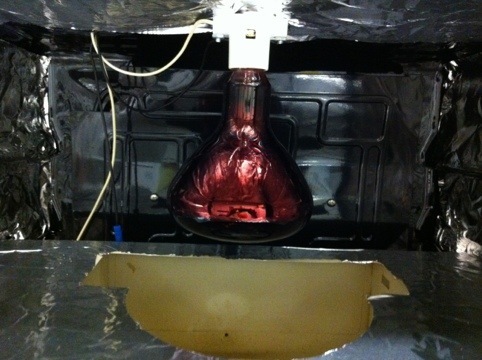 Inside of the wine box I sprayed glued foil onto the glass and around the fan housing and light housing. This fan came out of the hood unit in my kitchen, it was old soo I cleaned it up and put it to use. 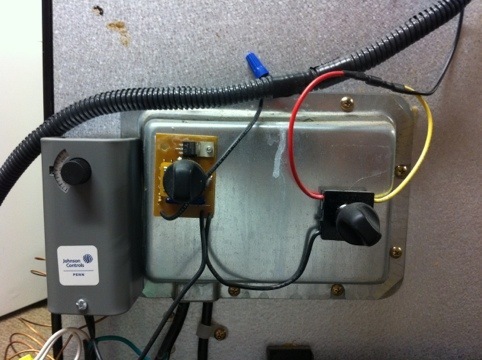 Digital temperature and humidity gauge is mounted on the side and an access hole for the thermostats. Far left: Thermostat for a water based heating unit, temperature range is 100°F to 250°F. Middle switch: Variable switch to control the fan speed. Far right: Light switch, it is not necessary as both the fan and the light are wired into the relay on the thermostat.